To few men who at one time wore the uniform of the North West Mounted Police has come greater honours for service than those awarded to Edward Hilliam. Edward was an example of the old school of soldiering in the British Army. 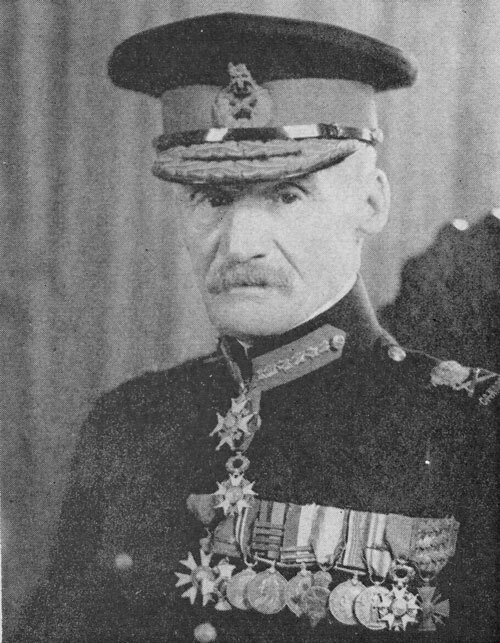 By the end of World War I, four ex-Force members had risen to the rank of a military general: Major General Sir Samuel Benfield Steele (Reg. #O.40 ex-NWMP Superintendent); Lt. General Sir Archie C. MacDonell (Reg. #O.95 ex-NWMP Inspector); Brigadier General Huntley Ketchen – (Reg. #3002 – ex-S/Sgt), and Brigadier General Edward Hilliam (Reg. #2983 – ex Sgt). 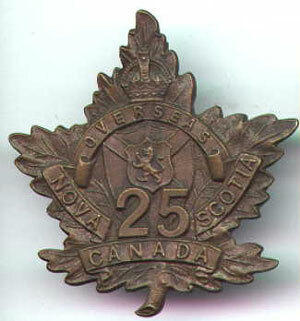 all volunteered for World War I and served in the Canadian Expeditionary Forces. Of these four generals, the story of Edward Hilliam stands out as a testament to an individual of unwavering courage and leadership in the face of danger. With his dedication to duty and country, he rose from the rank of a Trooper to a Brigadier General in the Canadian Army. Edward Hilliam was born in December 1862 at Spalding England. His father was Captain Thomas Hilliam and who was closely associated with the 2nd Volunteer Battalion of the Lincolnshire Regiment. While growing up, Edward attended both public and private schools. 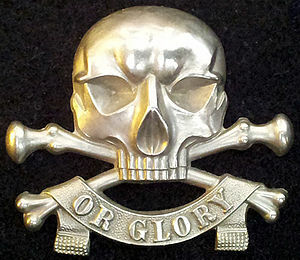 At the age of 21, he enlisted in the famous British 17th Lancers (Death or Glory Boys). It was with pride that this cavalry regiment participated in the “Charge Of The Light Brigade” on October 25, 1854 at the Battle of Balaklava during the Crimean War. 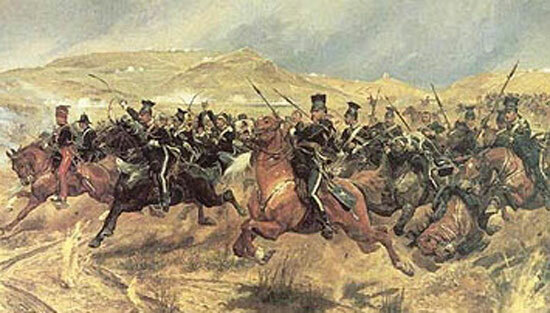 It was the 13th and 17th Lancers which lead the charge against unrealistic odds into the valley of death. Three other cavalry regiments also participated in this charge. At the beginning of the charge, there were 670 cavalrymen and after the battle there were 156 killed and 122 wounded. The charge would later serve as the ultimate example of unselfish bravery and courage regardless of the odds. Within the 17th Lancers, the members were extremely proud of their regiment and battle honours. It was within this historical association that Edward Hilliam became conditioned to serve his country at whatever cost. Painting of the British Light Brigade charging the Russian Guns at the Battle of Balaklava during the Crimean War. Over the seven years in the regiment, Edward advanced through the ranks starting off as a trooper and ending at the rank of Captain. While in the regiment, he established himself as a champion boxer and won three boxing trophies in the British Army and two years as the British Army’s champion swordsman. Desiring a change of surroundings and a new adventure, Edward immigrated to Canada. 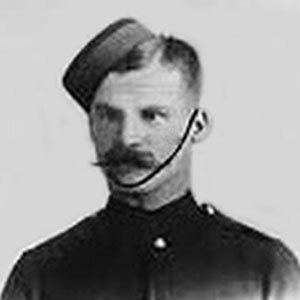 While in Ottawa, he applied for the North West Mounted Police and was sworn into the Force as a Constable on December 4, 1893 at the age of 28. From “Depot” Division in Regina, Edward was posted to Lethbridge, Calgary and back to Regina. During this time, he was promoted to Corporal on April 25, 1897 and to Sergeant on November 15, 1898. As a Sergeant, he was the riding master at “Depot” Division in Regina. At “Depot” Division, Edward Hilliam established a reputation as a swordsman. One reputed story about Edward went – on swordsman – “He’d done a lot of it in the 17th Lancers, and carried his art into the Force. One day a very famous Frenchman was visiting Regina. He was obviously a Big Shot, for he was being conveyed around and everyone was being terribly deferential to him. This chap apparently fancied himself as a swordsman, and in some way it came out that Sergeant-Major Hilliam was just right on the top rung of swordsmen – in Canada. That interested the visitor. Perhaps, the Sergeant-Major might like to have a bout – he himself didn’t mind crossing swords with a sergeant-major! The sentiment was conveyed to Hilliam, who rather froze at it, for apparently this Frenchman actually was good. Hilliam sort of felt that he might emerge second-best, and that wouldn’t be good for morale in the old R.N.W.M.P. Of course, he had to accept; but right away he began to figure how to get out from under – gracefully. As time grew near for the bout, Hilliam had a grinding stone carried out into the open, and he began most ostentatiously sharpening his sword. There was quite an ado around him with our guys in the Force giving him a hand. As Hilliam hoped, this full attracted a great deal of attention, particularly from the officers. The Commanding Officer sent out to ascertain what was going on, and the word came back that Hilliam was sharpening his sword for the ‘duel.’ This was conveyed to the French visitor. ‘Duel!’ He was aghast. He hadn’t intended any duel. It was just ‘pour le sport!’ He didn’t mean to fight with sharpened swords. Foils with the buttons on were his speed. This was conveyed to Hilliam. His reaction – nothing doing. When Hiliam fought with swords, he found with swords; and that was all there was to it. 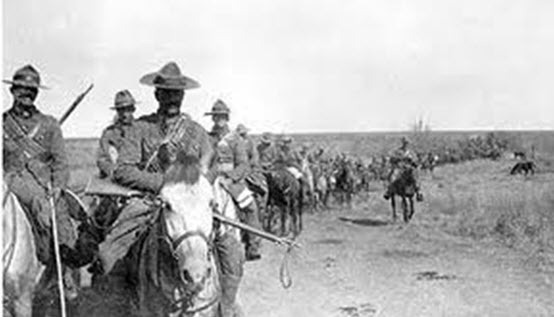 For the Boer War, the Canadian government approved the formation of two regiments to participate in the war. Sergeant Hilliam enlisted in the 2nd Canadian Mounted Rifles organized by Supt. Sam Steele. Edward Hilliam was promoted to the rank of Sergeant Major and was discharged from the Force on November 30, 1900. 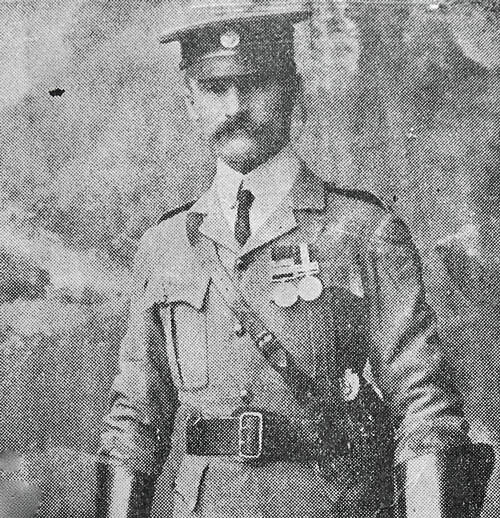 During the Boer War, Edward Hilliam quickly distinguished himself by his actions and leadership. In the field of battle, he was wounded three times and had five horses shot out from under him. In light of his actions and leadership, he was promoted to the rank of Captain and placed in charge a unit of the Canadian Scouts. 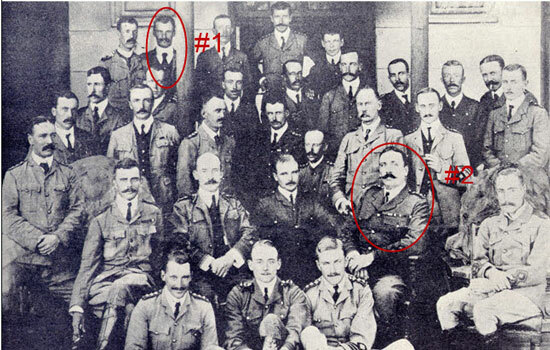 After the end of the Boer War, Edward Killiam secured a Captain position with the Cape Mounted Police and remained in with this organization for the next three years as the Commander of their training depot. Thereafter, he returned to Canada and established a vegetable farm and opened a store in Edmonton Alberta. 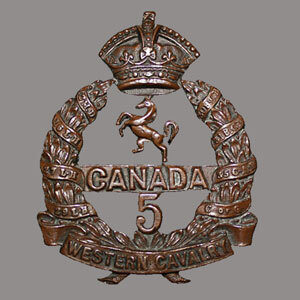 Photograph of the 5th Canadian Infantry Battalion (Western Cavalry) cap badge. With the declaration of war on July 28, 1914, Edward Killiam quickly enlisted on August 4th, 1914. He was promoted to the rank of Captain and transferred to the 5th Battalion on September 23, 1914. The Battalion were transported to Valcartier Quebec to join up with the other initial Battalions of the Canadian 1st Division. This first contingent departed in October 1914 and established a Canadian Expeditionary Force training base at Shorncliffe Kent England. At Shorncliffe, Captain Hilliam spend several months drilling his men and receiving trench training from British Army instructors. The relatively green Canadian 1st Division landed in France in 1915 and were deployed on the front line near the Belgium town of Ypres. On the opposite battle line, the Canadians faced the 51st, 52nd and 53rd Reserve Divisions of the German Army. In early April 1915, the Germans had massed 32,000 troops preparing to advance a break through the Allied lines near Ypres Belgium. This unexpected attack would be Canadians first engagement against an experienced European army. At 4 PM on April 22nd 1915, the 2nd battle of Ypres began. The Germans resumed their bombing of Ypres and released 168 tons of chlorine gas into the French Algerian lines which were on the right flank of the Canadian 1st Division. The chlorine gas killed most of the Algerians and left a four mile gap in the Allied lines. The Canadians had no defense against the chlorine gas and only the Canadians stood between the Germans and victory at Ypres. In addition to defending their own positions, Canadians troops rushed to cover the four mile gap which the Germans were about to flood through. 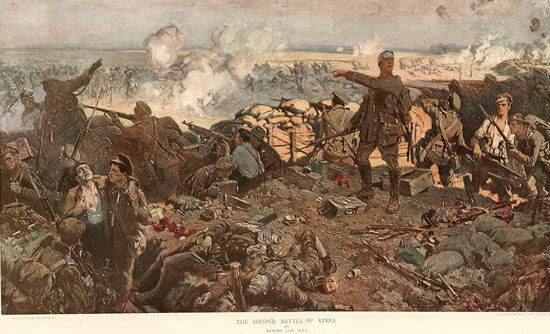 Painting of the Second Battle of the Ypres depicting members of the Canadian 1st Division. The green 17,873 Canadian troops faced the rush of 32,000 Germans. Despite the odds, the Canadians fought gallantly and many were killed and wounded. From this battle, the Canadian Division earned a reputation as tough and dependable troops but this achievement came at a very high price – 6,000 casualties over four days of fighting. At Ypres’ Hill 60 and repeatedly leading his men on attacks against advancing Germans, Captain Edward Hilliam was shot in the left chest. After the battle, Edward Hilliam was evacuated to England. To the surprise of everyone, Captain Hilliam made a extraordinary recovery and returned to the front. Photograph of the 25th Nova Scotia Battalion of the Canadian Expeditionary Forces in World War I. Once back in the front lines, Captain Hilliam was deployed to the 25th Nova Scotia Battalion and was soon thereafter promoted to Major then Lt. Colonel of the Battalion. The inspired leadership of this well trained and efficient officer stimulated the fighting qualities of his Battalion. In Lt. Colonel Hilliam, they found a great commander who led the unit to great heights of efficiency and whose personal gallantry was an inspiration to all his men. Wounded on several occasions, he refused to leave the field and stayed with his troops until their objectives were secured. His bravery and leadership were cited in six different dispatches to the Canadian Expeditionary Forces Headquarters. Despite being wounded, Edward Hlliam was one of the first to enter the captured village of Courcelet. It was also Edward’s philosophy not to leave the battlefield until the objective had been achieved. The battle of the Somme in 1916 was one of the largest of World War I, in which more than 1,000,000 men were wounded or killed, making it one of humanity’s bloodiest battles. 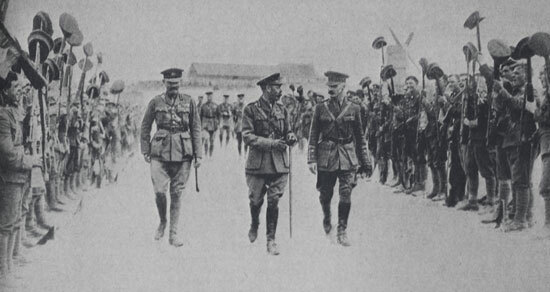 At the Somme, General Hilliam worked in close quarters with the French Army. The French were so impressed with his feats of bravery that they awarded Edward Hilliam with the Officer’s Legion of Honour and the Croix de Guerve with two leaves. 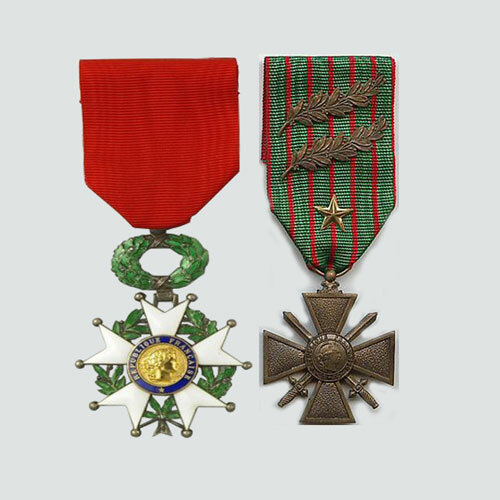 Photograph of the French Legion Of Honour and the Croix de Guerve medals. In early January 1917, Edward Hilliam was promoted the rank of Brigadier General based on his leadership and unwavering courage. On April 10, 1917 – Brigadier General Edward Hilliam commanded the 4th Canadian Division’s 10th Brigade (44th Winnipeg Battalion and 50th Calgary Battalion) was delegated to take the final objective on Vimy Ridge – “The Pimple.” The 4th Division encountered the stiffest fighting compared to the other three Canadian Divisions. However with persistence and leadership, the final objective had been achieved on April 12, 1917. The remaining German defenders retreated across the far valley to establish their next line of defense. 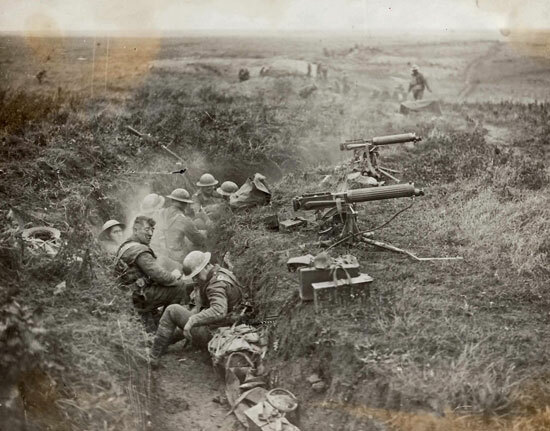 The collective effort Canada Corps were able to hold the battle ground which the French and British had failed to retake over the past two years. A great achievement for the Canadian troops. On November 12, 1917, he was seconded to the 44th British Brigade until May 21, 1918 and to the 102nd British Infantry Brigade until May 17 May 1919. While with the British Army, he was promoted to the rank of Major General. General Hilliam was termed by his men as a ‘soldier’s soldier’ and the honours and decorations which were given to him were well earned. He was not only a tactician, but was an inspiring leader to whom danger was unknown. Always he had the welfare of his men at heart, and the organization and morale of the men under his command was always at the highest point of efficiency. Mentioned in Dispatches six times. 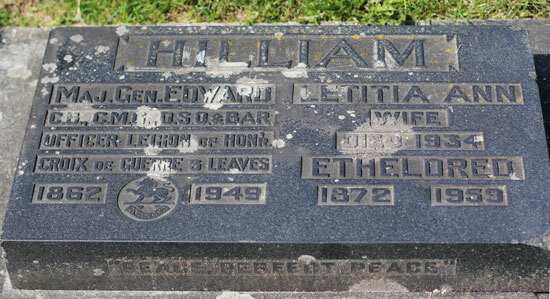 With the end of World War I and at the age of 57, Edward Hilliam returned to civilian life and settled down in Sorrento British Columbia. While living in Sorrento, he would regularly receive visitors from a wide range of past veterans including Julian Byng who was the Canadian Commander at Vimy Ridge and in 1919 was appointed the Governor General of Canada. 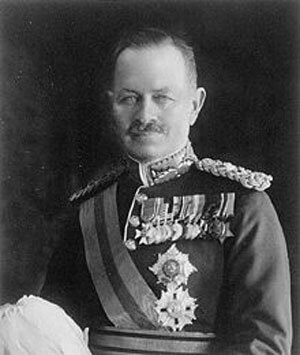 Canadian Governor General Julian Hedworth George Byng. Several years later, Edward’s wife passed away and he moved to Vancouver to be cared for by his sister. The consequences of his bravery and wounds eventually caught up with him. For the last years of his life, he was totally blind, deaf and had difficulty breathing with only one lung. On May 21, 1949 at the Shaughnessy Military Hospital in Vancouver BC, Brigadier General Edward Hilliam passed away at the age of 86. At his funeral, many Boer War and World War I veterans attended to pay their last respects. The Force provided a nine member Honour Guard. His remains were laid to rest at the Ocean View Burial Park in Burnaby BC. Steele, Sam – “Forty Years In Canada Reminiscences Of The Great North-West” – page 286. Beahen, William & Horrall, Stan ‘ ““Red Coats On The Prairies: The North-West Mounted Police 1886 – 1900.” – Centax Books (page 286). “Hilliam’s Courage and Kill Will Long Be Remembered” – RCMP Scarlet & Gold Magazine (33rd Edition – 1951) – page 25. (page 206 – “Shock Troops: Canadians Fighting The Great War 1917 – 1917” by Tim Cook). Cook, Tim of “At The Sharp End: Canadians Fighting The Great War 1914 – 1916” Penguin Books ( (page 459).